Perhaps I’m dating myself when I say I can’t believe that it has been twenty years since High on Fire formed. On the other hand, maybe just too much fun has been had across the board since. I digress. What can be certain is that after listening to the band’s eighth release, Electric Messiah, it is abundantly clear that the same feeling is maintained throughout the years. Surrounded by Thieves was a gargantuan album and my first exposure to the band. In the years since, Matt Pike, singer and guitarist, has kept the focus consistent: loud, raucous Metal, perfect for throwing back some beers to or as the soundtrack to a personal journey, literal or imagined. It has been an important year for Pike as this is his second full-length to be released after the new Sleep album, The Sciences. Any musician would be envious of his situation having two celebrated and acclaimed bands across the spectrum of heavy music. “Spewn from the Earth” erupts as its name implies. Immediately, one is captured by the mammoth-sized sound as it is obvious the band have found their fourth member in producer Kurt Ballou (Converge, Torche, Kvelertak). The song literally sounds like the band huddled, took a shot of high-test moonshine, and on Ballou’s signal to go, recorded it live in one take. Though that may be stretching it a bit, the bottom line is that this is indeed the ideal song to kickstart the album as it has a driving gallop, commanding riffs, and fuzzed-out monster bass. The following track, “Steps of the Ziggurat/House of Enlil” delves deep into the ether following the momentum previously established. Over nine minutes in length, it is epic, to say the least, evidently based on the Sumerian creation myth. The main riff section ties it all together sounding like the march of an immortal army with the ever-hasty bass drum propelling it. It is a song with a stately feel, a noble birth, and divine power in the spirit of epics like Cream’s “Tales of Brave Ulysses”. The title track is third and explosive. The main riff is scorching as it has the vibe conjured from the same well drawn from by Judas Priest’s “Exciter,” Motorhead’s “Bomber,” and Metallica’s “Metal Militia”. While it could, on one hand, be labeled as meat and potatoes Metal, there is magic in songs like this. The sixth track, “God of the “Godless” is another fierce offering, sounding at one point like the soundtrack to a momentous cataclysm while during the solo, Pike delivers a majestic ode to his lyrical deity. “The Witch and the Christ,” the eighth track, features a unique riff that runs strong with groove. It can be safely said that there is no filler on this record, and the magic formula is the way the band has been deftly captured in the studio. One could not ask for a huger sound, and the effect of being a solo audience member in the front for a High on Fire show runs throughout. This band is enough to restore the faith of disillusioned veterans and spur on the Metal heroes of tomorrow. Seeing them live was proof that just three people can have such an enormous sound. Furthermore, Electric Messiah is a gleaming representation of their sound. Matt Pike would have to clone himself to obtain a more gigantic guitar sound. He manages to have a tone with the richness of his Doom side and the raunchy swagger of classic Metal. In his riff writing, he incorporates classic chord progressions twisted to his own liking and a percussive attack that sometimes locks in with the rhythm section. The leads are there too. He combines pentatonic licks with more dissonance and outright experimentation to create leads that are reflective of the larger theme of the song, be it aggressive or momentous. All of this could not occur without the help of bassist Jeff Matz and drummer Des Kensel. Starting with Matz, a closer look reveals the intricacies of his bass playing. His role is somewhere between reinforcing the percussion and the guitar in an area of his own creation. Everything is done for the benefit of the song. This is evident in Kensel’s drumming as well. The double kick is always there providing an encouraging thrust to the music. All songs are like a blank canvas for the drummer as he forms an extension of the riff, justly filling out the band. 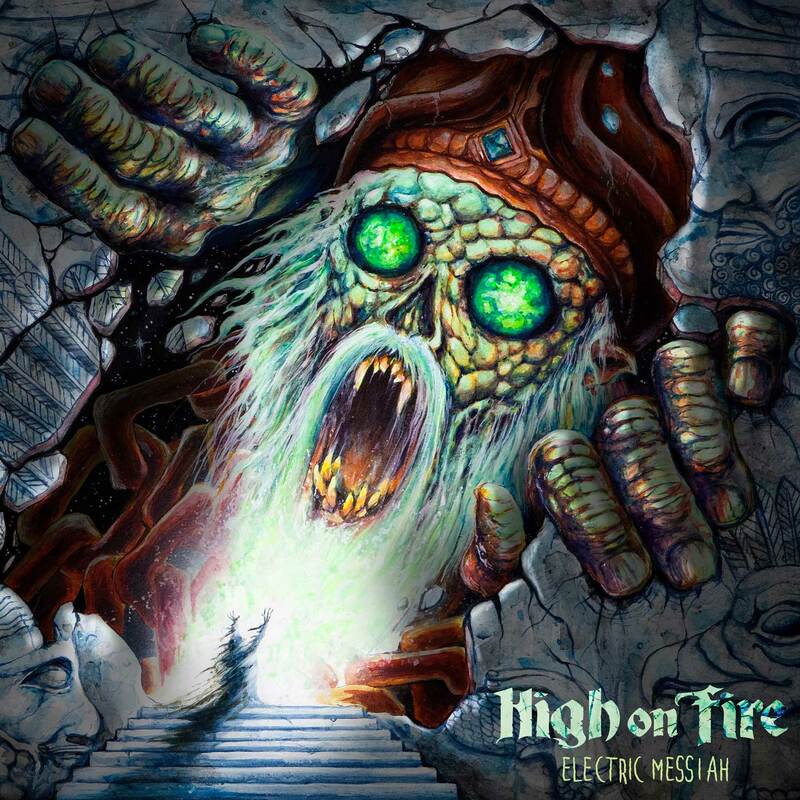 High on Fire fills in a very particular void within the Metal scene. While musicians across the board have become jaded or too introspective, this band delivers in a primal way that mirrors the strides made by older crafters of this style. In creating this music, the band have injected their own custom formula for success: hard work and heart. After twenty years, Electric Messiah is proof that the well has not run dry. Nine tracks of fist-pumping fury are a testament to that.